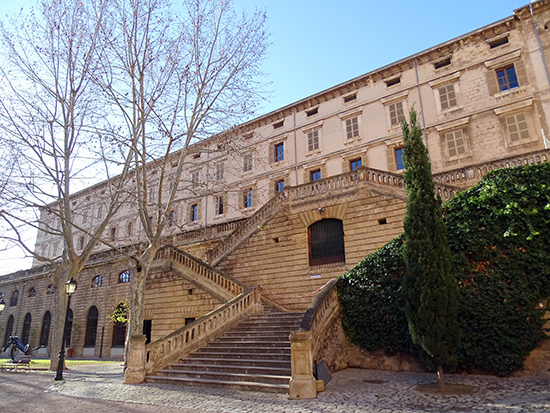 The building that is the cultural headquarters of the Consell de Mallorca was initially the Casa de la Misericòrdia (House of Mercy), an institution founded by the Jesuits in 1565, which was reformed and expanded until the early to mid-19th century. The building’s social application, when it housed orphans and those in need of help, ran until 1977. From then on it was used as a school of music, until it was taken over by the Consell de Mallorca. La Misericòrdia is today a multifaceted cultural centre, with offices, meeting rooms and exhibition spaces. Worthy of mention are the Capella (chapel), dedicated to displaying modern art; Arxiu del So i de la Imatge (sound and image archive), which is the department responsible for Majorca’s audiovisual heritage, and the Lluís Alemany and Cultura Artesana (artisan culture) libraries, with specialised collections. The building is surrounded by gardens, inspired by the ideas of botanical gardens at the start of the 19th century, and which today are also a space for exhibitions, in this case sculpture, and other cultural events. 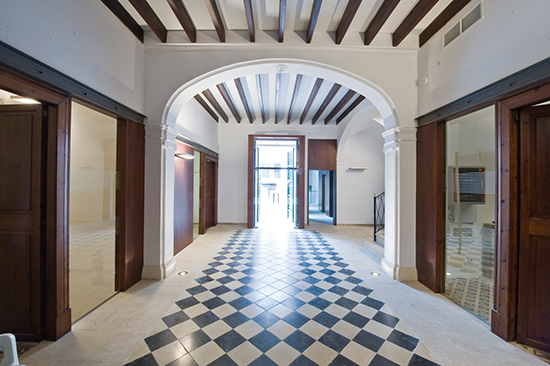 Can Alcover has been the property and headquarters of the Obra Cultural Balear since 2008. One part of the centre is a museum for the writer Joan Alcover (1854-1926), one of the most significant poets of the early 20th-century Majorcan literature. The house was an important literary centre at the turn of the century. Joan Alcover organised literary discussions on Sunday afternoons, between 1895 and 1920, which brought together writers, artists and intellectuals from different generations, ideologies and backgrounds. This is where the great and the good of Majorcan literature in the first half of the 20th century were trained, and it is also where bridges with Catalonia were built, through figures such as Josep Carner and Santiago Russinyol. Can Alcover – Espai de Cultura was opened in 2008. It has different spaces where cultural events can be held, and it has a lively calendar of cultural activities. Inside, the café and garden invite you to take in the pleasures of this little oasis in the historical centre of the city. The poet and writer Robert Graves (1895-1985) arrived in Deià in 1929 and in 1932 he built the house called ca n’Alluny. From Mallorca he maintained relations with the artistic and intellectual world and that led to many of the great artists of the time staying in the town of Deià. Thus, the small town that had already attracted painters and illustrious travellers became an important focus of international attention. Today, Ca n’Alluny is the headquarters of the Robert Graves Foundation, managed by the Govern de les Illes Balears (Balearic government), the Ajuntament de Deià (Deià’s council) and Graves’ family, and has been open to the public since 2006. The house and gardens remain virtually intact as they were in Graves’ time, allowing visitors to immerse themselves fully in his creative atmosphere. Only a few areas have been given new uses, to accommodate an exhibition focusing on the life and work of the writer. An audiovisual documentary rounds off the information on offer. 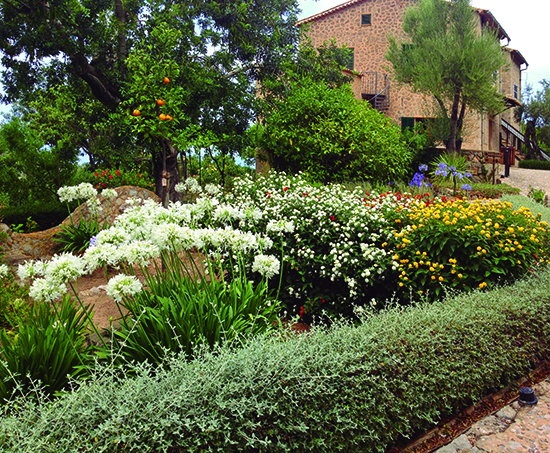 The garden is planted with lemon trees, olive trees and other native plants and allows visitors to enjoy their visit in a peaceful surrounding, full of nature and poetic spirit. Llorenç Villalonga (1897-1980) is considered one of the leading novelists of Catalan literature. His best-known novel is Bearn o la sala de les nines (translated into English as The Doll’s Room), set in 19th-century Majorca, which reflects the loss of values in a society in total transformation. Casa Llorenç Villalonga. Museu Literari (Llorenç Villalonga’s House: Literary Museum) is located in an imposing 17th-century house, Can Sabater, which was the writer’s second residence. The building has two floors and a splendid Mediterranean garden, and is the property of the Consell de Mallorca and forms part of the network of literary museums managed by the Fundació Casa Museu. It houses the important literary archive of the author, made available to interested parties, and it also has a library and reading room. The centre is a dynamic museum, which offers an informing tour through the author’s life and work, a journey to the centre of his literary universe through the rooms of Can Sabater, this ancestral home in the town Binissalem, laden with architectural and ethnographic worth as full of literary echoes. As a centre for activities, it has a regular programme of shows, readings and literary tours. In the summer months there is a series of outdoor activities, in the garden, with the title “La lluna en vers” (The moon in verse). 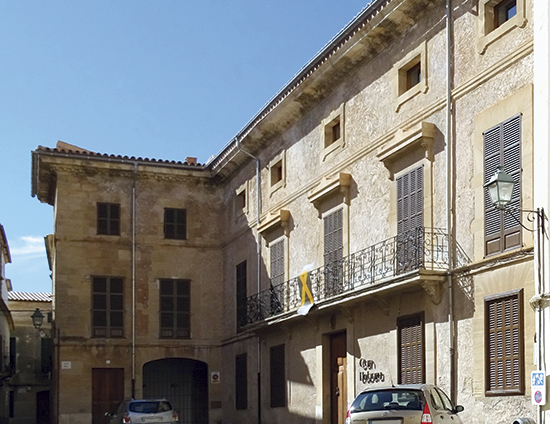 Can Llobera is a cultural centre that hosts many services in Pollença: the public library, the archive… And also the Casa Museu Can Llobera, a museum which preserves and exhibits an excellent example of an ancestral home of the nobility in the second half of the 19th and early-20th centuries. 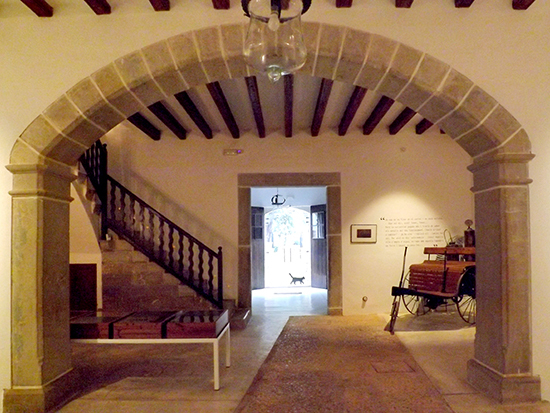 The building was renovated jointly by the Ajuntament de Pollença and the Consell de Mallorca, and it retains its historically important architecture and the spaces characteristic of an old manor house such as the façade, entrance and hall, kitchen and store, the imperial staircase, the mezzanine dining room and the slope of the first floor, as well as the original furniture and décor. Can Llobera also hosts Pollença’s archive, with the most important holdings on the island outside of Palma. The most significant is the archive of the Knights Templar and the Knights Hospitaller. Can Llobera belonged to the Llobera family from Gotmar, who repeatedly made alterations to the house, and furnished and decorated it with luxury items from Paris, Barcelona and Palma. It was the house of the doctor Miquel Llobera, a humanist and intellectual, and also an important part of the childhood of Miquel Costa i Llobera, his nephew, who received from his uncle a classical education that was vital to his future development as a writer. Miquel Costa i Llobera, a key figure in early-20th century Majorcan poetry, is a writer closely linked to the landscape around Pollença, especially through is emblematic poem “El pi de Formentor” (The Formentor pine). Pollença also is home to the Fundació Rotger Villalonga in Cala Murta, Formentor. This organisation focuses on the figure of Miquel Costa i Llobera, and runs the research centre that carries his name as well as running a calendar of regular events. A regular date is the homage in his name that has taken place every October since 1934 at Formentor. The centre is run by the Fundació Casa Museu (itself run by the Consell de Mallorca) with the support of the Ajuntament de Santanyí and Blai Bonet’s estate, who have donated the writer’s legacy so it can be catalogued and consulted in the centre. As a dynamic centre, it has a regular programme of shows, readings and literary tours. In the summer months there is a calendar of outdoor activities, in the garden, with the title “La lluna en vers” (The moon in verse). The centre is the temporary home of the future Casa Museu Blai Bonet, which the Consell de Mallorca intends to create in what was the writer’s house on carrer de Palma, 74, Santanyí. Antoni M. Alcover is a monumental figure in Majorcan culture: a linguist and folklorist, he undertook the completion of the great Diccionari Català-Valencià-Balear and he also collected and published an exhaustive anthology of Majorcan folktales. In 1999 the Ajuntament de Manacor founded the Institució Pública Antoni M. Alcover, to pay tribute to and preserve the memory of the renowned linguist and folklorist. The organization develops, on the one hand, academic activities offering space for linguistic research and studies of the figure of Alcover himself. To this end it regularly publishes the Bolletí de la Institució Pública Antoni M. Alcover and holds the Premi Ciutat de Manacor d’Assaig Antoni M. Alcover for essays. At the same time, the Institution also aims to promote the figure of Alcover to the public, especially through its museum space and many cultural activities. The headquarters of the Public Institution Antoni M. Alcover is a magnificent listed mansion from the mid-19th century, can Socorrat, in the centre of Manacor. It is an excellent example of an ancestral home from the second half of the 19th century facade, with a broad façade, and three floors. One of the most important rooms in the house is the wallpaper room on the first floor, which has two windows. The wallpaper used to decorate the room features bordered floral motifs. 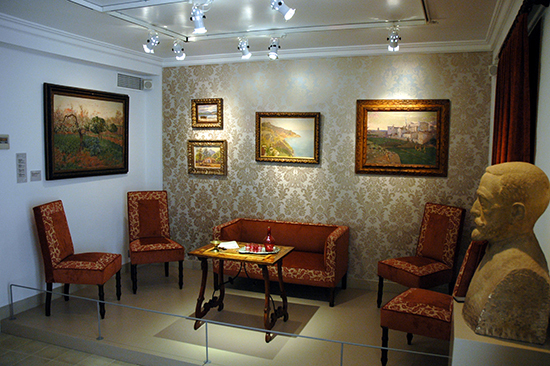 The Bonet family, the last owners of the house, called it the Romanones room, because that is where they received the count Alvaro Figueroa y Torres when he visited. 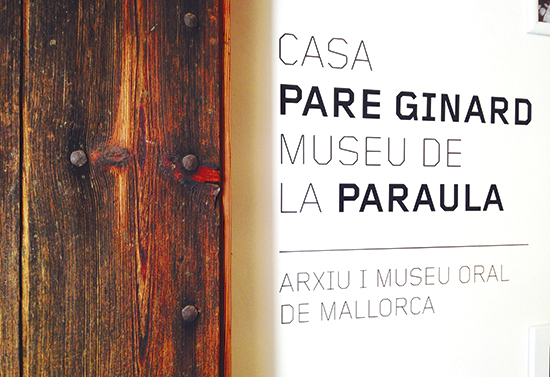 Casa Pare Ginard: Museu de la Paraula (Pare Ginard’s House: Museum of the Word) located in the town of Sant Joan, aims to promote the oral heritage of Majorca. It is owned by the Consell de Mallorca and forms part of the network of literary museums managed by the Fundació Casa Museu. The centre is the ancestral home of Rafel Ginard (1899-1976), a folklorist who was vital in collecting and studying the oral heritage of Majorca. 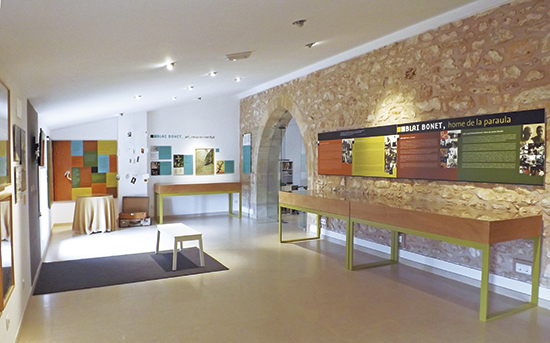 The centre offers a trip back in time, to discover Majorca’s culture, its customs and traditions, through the combination of a range of texts and old photographs from various private collections in Sant Joan. As well as being a museum, Casa Pare Ginard is also home to the Arxiu Oral de Mallorca (Majorca Oral Archive), a project that aims to collect a wide range of oral sources including recordings, books and other formats, which continues the work of Ginard himself. As a centre for activities, it has a regular programme of shows, readings and literary tours. In the summer months there is a series of outdoor activities, in different places in and around Sant Joan, with the title “La lluna en vers” (The moon in verse).